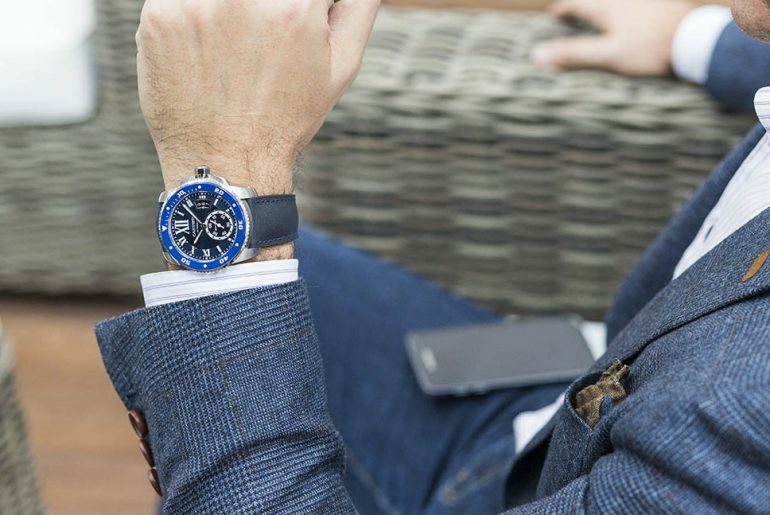 As for watch brands, advanced wristwatch and high jewelry watch reflect their watchmaking standards and excellent creativities. 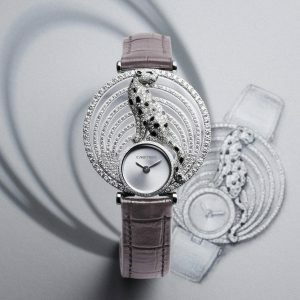 High jewelry watch includes designers’ unique creativities and extraordinary craftsmanship. The jewelry carved by watchmakers and jewelry designers is infused into new vitality. 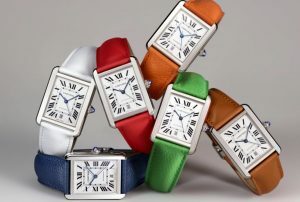 Themed as precious gems, Cartier fuses high jewelry and advanced timepieces. Two kinds of iconic craftsmanship expresses the quest for beauty together. In addition to innovation and excellent craftsmanship, The essence of Cartier is to give life to the beautiful gems. 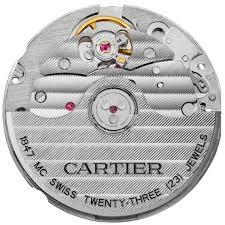 High Jewelry visible hour “Papyrus” watch, mechanical movement with manual winding caliber Cartier 8971 MC. 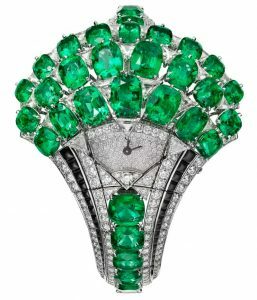 Rhodiumized 18K white gold dial, case and bracelet set with 32 antique cushion-shaped step-cut emeralds from Zambia totaling 38.20 carats, 26 triangular-shaped step-cut diamonds totaling 5.43 carats, onyx, 642 brilliant-cut diamonds totaling 9.94 carats, black oxidized steel sword-shaped hands. Unique piece, wrist size: 163 mm. 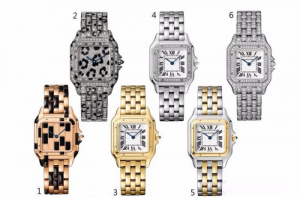 Although inspired by classic tradition, “Papyrus” high jewelry watch shows modern style. 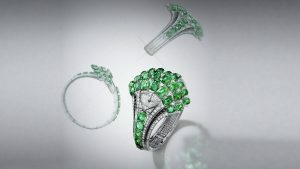 Cartier designers looked through historical archives that Cartier collected and also were inspired by the emerald and its mild green, they finally chose Papyrus. Wide leaves of Papyrus and rare emeralds show modern style with freedom. 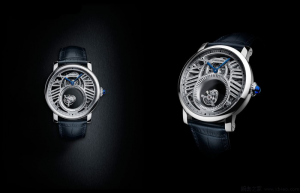 High Jewellery Tourbillon Mystérieux Azuré watch, Manufacture mechanical movement with manual winding and mysterious double tourbillon, calibre 9463 MC. Case and chain in rhodium-finish 18K white gold set with a faceted oval-shaped Ceylon sapphire of 25.93 carats, with 1,017 brilliant-cut diamonds totaling 15.92 carats, with 31 rose-cut diamonds totaling 1.00 carat, with 18 baguette-cut diamonds totaling 2.45 carats, with 14 sapphires totaling 2.27 carats, with a princess-cut diamond for 0.32 carats, and with onyx, with a sapphire crystal and case-back, rhodium-finish steel sword-shaped hands. Water-resistant to 3 bar (approx. 30 metres). Unique piece. Multi-layered lines form the pendant style, like a dancing butterfly. Sapphire wings, the body set with dazzling diamonds. 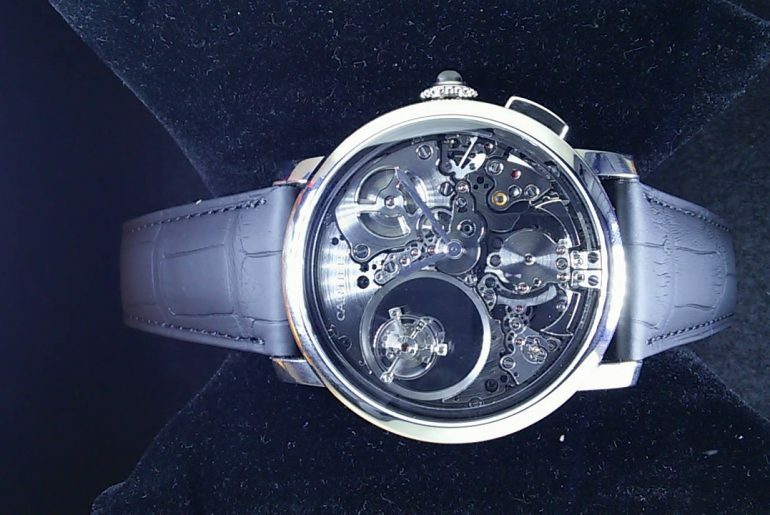 Double mysterious tourbillon crafted in the pure dial look like hanging in the air. A delicate mechanism hidden in the jewelry deserve to be outstanding. The back of the work is made delicately, and its well-polished movement stands stands out perfectly. It took masters 2,050 hours (17 months) to accomplish such a masterpiece. 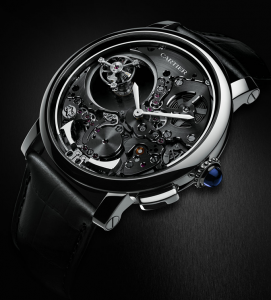 High Jewelry Cartier à l’Infini visible hour watch, mechanical movement with manual winding, caliber 101. 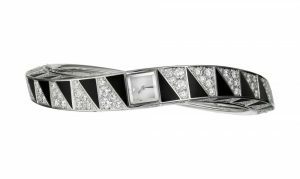 Rhodiumized 18K white gold case and bracelet set with 320 brilliant-cut diamonds totaling 6.10 carats, black lacquer décor, silvered translucent lacquered sunray effect dial, 18K white gold pyramid hour marker at 12 o’clock, rhodiumized steel sword-shaped hands. Wrist size: 163 mm. Black and white, smooth jade and grained decoration with brilliant-cut diamonds and rose-cut diamonds form clever contrasts. 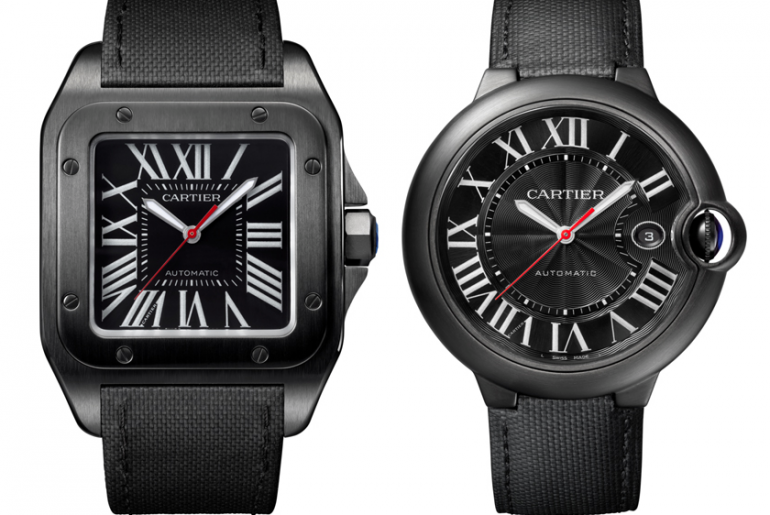 It took 600 hours to achieve Cartier à l’Infini visible hour watch with balanced beauty. Saturn bracelet in 18K white gold, diamonds and black jades. Simple but elegant style and delicate but charm lines reveal perfect craftsmanship. Every girl is on the quest for beauty throughout the world. In addition to being born beautiful, some accessories can also set off girls’ charm. It is the value of jewelry. When we appreciate a piece of jewel, we find that it’s gorgeous and flawless from any angle. It is indeed designed delicately and carefully from its shape, gem types, cutting, lustre and detail polishing finish. Jewelry reflects a design that perfectly presents products that nature gives to the human. 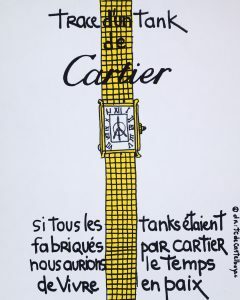 We can feel that from Cartier works. 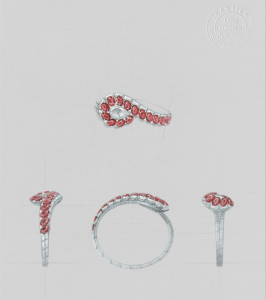 The Jeweller of Kings and the King of Jewellers, the widespread title proves Cartier’s status in the jewelry field. The brand from France has begun to build its kingdom of jewelry since 1874. 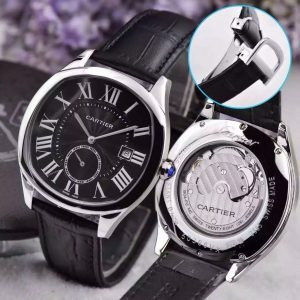 The timepieces would be noble and luxury until Cartier combined high jewelry and delicate watches. 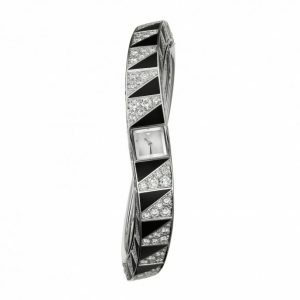 Different from sophisticated mechanical men’s watches, high jewelry watches for ladies stand out their elegance, nobility and identity. High Jewelry “Panthère Arctique” visible hour watch, mechanical movement with manual winding, caliber 101. Rhodiumized 18K white gold case and bracelet set with one cushion-shaped faceted turquoise-colored aquamarine of 39.28 carats, sapphire spots, emerald eyes, onyx nose, 1617 brilliant-cut diamonds totaling 33.91 carats, sunray brushed dial with hour marker set with one diamond, rhodiumized steel sword-shaped hands, wrist size: 157 mm. 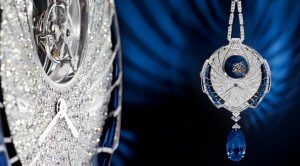 Cartier designers use their rich imagination to create the treasure that combines natural gems with a timepiece. 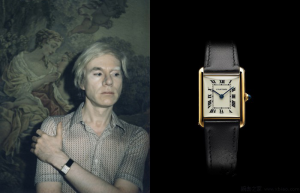 The most iconic panther watch case. 18K white gold panther-body bracelet is decorated with brilliant-cut diamonds, sheeny and luxury. Sapphire leopard prints, black onyx nose, and the eyes are decorated with emerald gems. 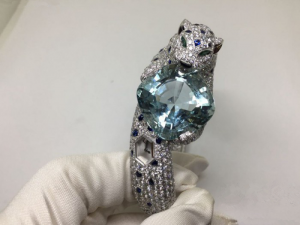 A cushion-shaped sapphire weighting 39.28 carats are held in front paws vividly. 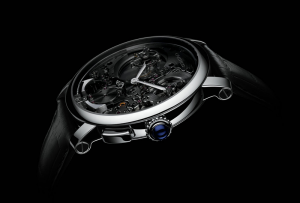 High Jewelry “Tutti Agrumes” Secret Hour Watch, quartz movement. 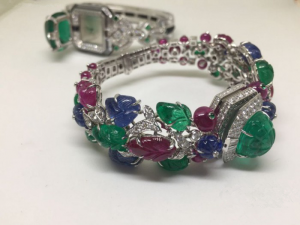 Rhodiumized 18K white Gold case and bracelet set with one cushion-shaped engraved Emerald from Colombia of 9.74 cts, engraved Emeralds, Sapphires and Rubies, Ruby beads, cabochon-cut emeralds, calibré-cut Diamonds, brilliant-cut Diamonds sun ray-brushed dial, emerald marker, rhodiumized 18K white gold sword-shaped hands. Water resistant to 3 bar (approx, 30 meters). Unique piece, wrist size: 159 mm. Born in the 1920s, the Tutti Frutti collection shows bright but unique colors. Cartier designers combine precious metals with rubies, sapphires, emeralds and diamonds to create the unique piece with delicate engraving. life-like gem leaves and fruits record the passing years and vibrant life. 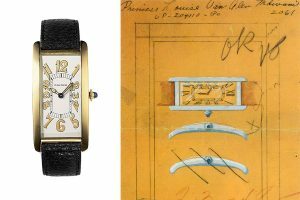 High Jewelry “Tutti Agrumes” Secret Hour Watch reflects Cartier’s unique aesthetics. 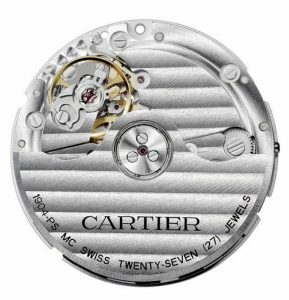 Cartier Trait D’ Éclat High Jewelry Watch, mechanical movement with manual winding, Cal. 101. 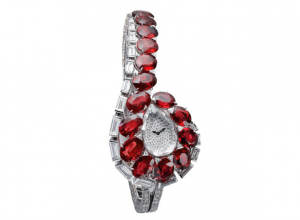 Rhodiumized 18K white gold case and bracelet set with 15 oval Mozambique rubies of 24.93 carats, brilliant-cut ladder-shaped diamonds and a brilliant-cut water drop-shaped diamond. Black oxidized steel sword-shaped hands. In the early of the 1920s, rubies were used to decorate Indian prince jewels. 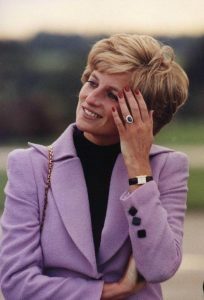 In April, 1956, Prince Grace who was wearing a Cartier crown with three cabochon rubies to take an official photo, and the rubies that can be removed and worn as a brooch were lived by her. In 1957, Elizabeth Taylor received a Cartier necklace with rubies from her husband, Mike Todd. The necklace witnessed their prefect love. 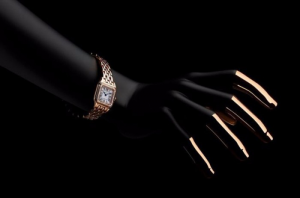 Cartier has been keeping exploring new, aesthetic and unique style to create more treasures. To display the craftsmanship of a movement, many watch collections are designed with the transparent back to be appreciated carefully. We probably pay attention to blued-steel screws fixing the splint, those blued-steel screws are produced by fire to from oxidation. A methodology that requires mastery over fire by way of precisely controlling the flame’s intensity to achieve the ideal shade of blue-or beige with the use of cooler temperatures. Blue steel is formed at 300 degree centigrade. In the absence of stainless steel, the fire process was used to prevent screws rusting. To this day, blued-steel screws are used for beauty. A life-like depiction of a panther was first engraved on the dial in 18K white gold to create “brushed” texture by fire. 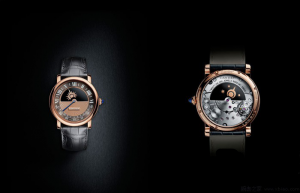 Ronde Louis Cartier XL Flamed gold, 30-piece limited edition, debuted at SIHH 2017. Ronde Louis Cartier XL Flamed gold, 42 mm, manufacture mechanical movement with manual winding, Cal. 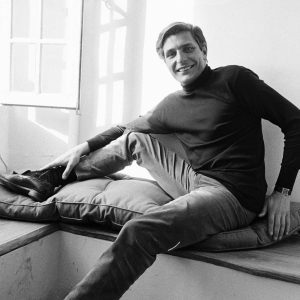 430. Case in 18K white gold, a diamond-set beaded crown, flamed gold dial, white gold apple-shaped hour and minute hands, sapphire crystal, sapphire case back, strap in black alligator skin, ardillon buckle in 18K white gold. Water-resistant to 3 bar (approx. 30 meters). 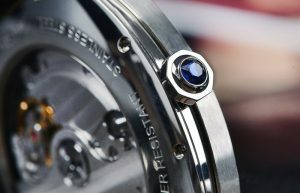 How will it be if the technology of producing blued-steel screws is used on the dial? Ronde Louis Cartier XL Flamed gold is the best model. 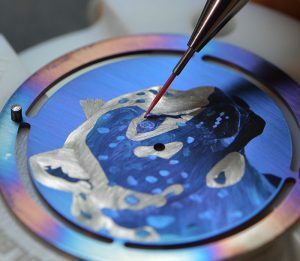 The vivid depiction of a panther on the dial seems to be painted with different colors at a glance. Close up, you will find that the real texture is different from the painted. The big cat’s eyes, prints, beard and brown hair are all finished into heating fire. 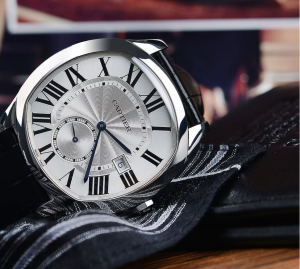 The life-like result is the real testament to the unassailability of Cartier’s craftsmen. 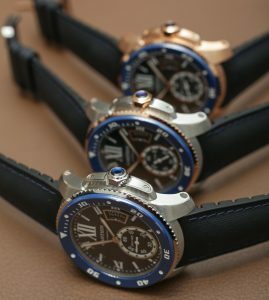 First, the craftsmen burns the whole dial into blue, then they scrape the surface of parts with tools and they burn the parts into brown, yellow or beige. Next, the process will be repeated again and again until the completed life-like depiction. 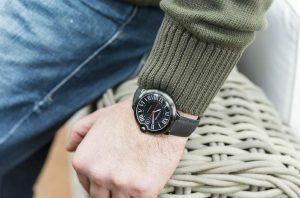 Although the technology of transforming the color of the dial into gradient effect isn’t so complicated as the enamel paint, making every hair life-like is quite difficult, as well. Drive de Cartier‘Cartier d’Art’ Leopard, 40 x 41 mm, manufacture mechanical movement with automatic winding, Cal. 1904 MC. Case and dial in 18K yellow gold, sword-shaped hour and minute hands, sapphire crystal and sapphire case back, strap in black alligator skin. Water-resistant to 3 bar (approx. 30 meters). It’s limited of 100 pieces. 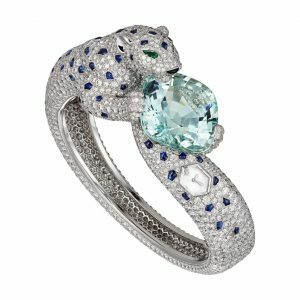 In 2017, Cartier released many watch collections inspired by a panther with exquisite skills. 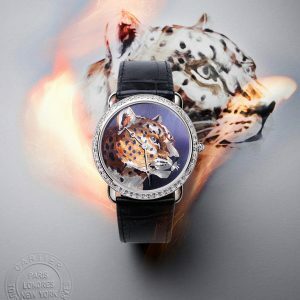 The unique feature of Drive de Cartier‘Cartier d’Art’ Leopard is that the big cat is extended beyond the sapphire crystal, as if a picture got out of the frame. Close up, we can appreciate its vivid hair from the bezel to the dial. Black leopard prints reflect bright luster with enamel techniques. Panthère Joueuse, 40 mm, manufacture mechanical movement with automatic winding, Cal. 9918 MC. Case in 18K white gold with diamonds, sapphire crystal and sapphire case back, strap in alligator skin. Water-resistant to 3 bar (approx. 30 meters). The panther appears to emerge from the dial, intent on catching the ball that remains tantalisingly out of reach. 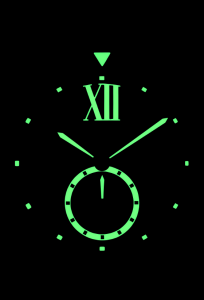 Its head and paw play the role of the minute hand while the ball marks the passing hours. 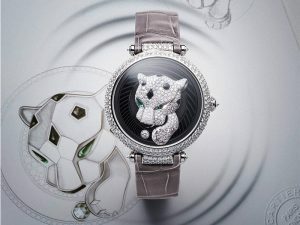 Making this an even more precious timepiece, the case and the strap attachments are set with brilliant-cut diamonds, with more brilliant-cut diamonds on the ball, as well as on the cat’s paw and head. Its eyes are two emeralds while its fur is spotted with lacquer. Panthère Royale, 36 mm, quartz movement. 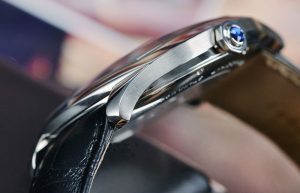 Case in 18K white gold with brilliant-cut diamonds, sapphire crystal and sapphire case back, strap in alligator skin. Water-resistant to 3 bar (approx. 30 meters). The Panthère Royale watch reigns supreme with a satin finished dial that twinkles with brilliant-cut diamonds. A sub-dial with hour and minute hands was designed at six six O’clock. 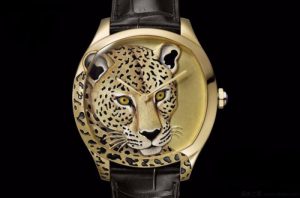 A full-figure leopard standing on above the sub-dial is like the king. Arc curves with diamonds and sapphire crystal show a perfect look. 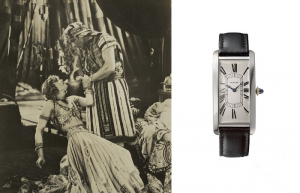 Cartier founded in 1847 has been top Jewelry and Wristwatch brand all around the world. Masterpieces from Cartier extend to now and give us endless surprises. 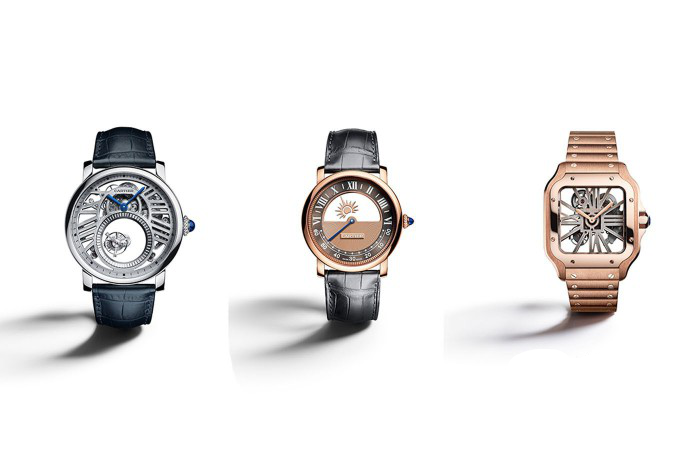 There is no doubt that Panthère de Cartier collection is the signature series among a great number of products. 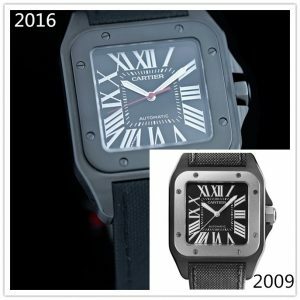 It’s a long history about Panthère de Cartier. 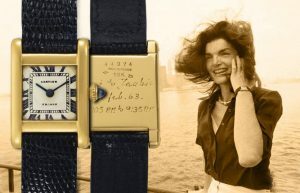 In order to seek inspiration, Jeanne Toussaint went to explore the American jungle along with Louis Joseph, the third generation of Cartier SA. They never expected that they came under attack by American panthers. Fortunately, they were out od the woods finally. Then they were in love with each other. Due to Louis Joseph’s married status, they suffered a lot. 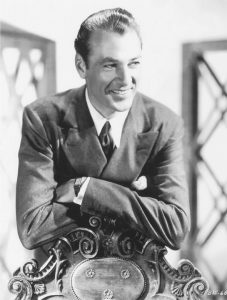 That Louis Joseph lost his life in a car accident left a wordless end for their love. 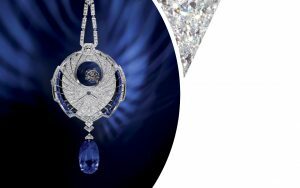 It came as Edward VIII and Wallis Simpson would marry, Duke of Windsor expected Cartier to design a jewel for Wallis Simpson. Jeanne Toussaint created a Panther brooch from her unforgettable experience. 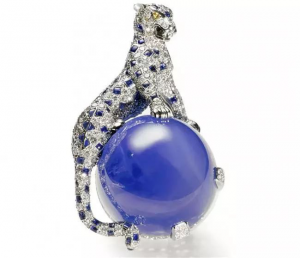 It’s the Panther brooch that opened the beginning of Panthère de Cartier collection. 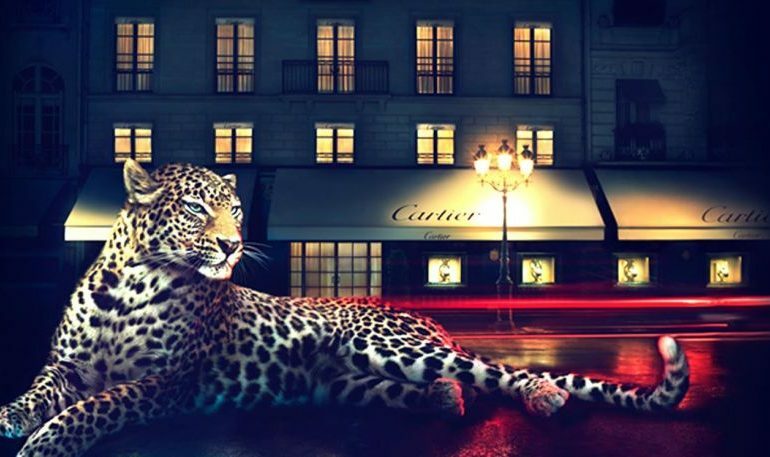 As the most beautiful animal in Cartier world, the American panther inspires designers excellent works. 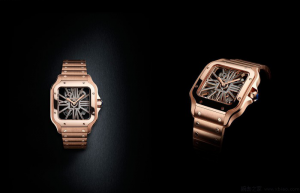 Besides, Ronde Louis Cartier collection and Panthère Joueuse collection gain much inspiration. 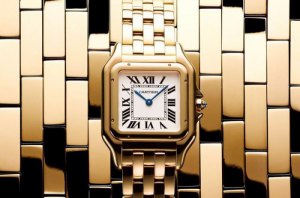 Panthère de Cartier collection inherits the classic styles-delicate and exquisite features from 1983. 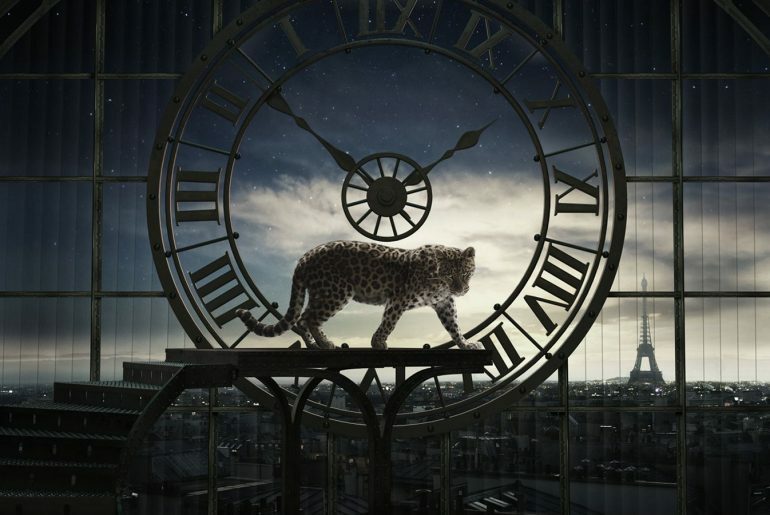 Through those timepieces within American panthers, Cartier describes the amazing integration of natural light and view, and the wisdom of teams and high end craftsmanship spreads out before us. Born in 1983, Panthère de Cartier isn’t visualised to embody the feature of the American panther. Chain links under the light and shadow show virtualized leopard prints. 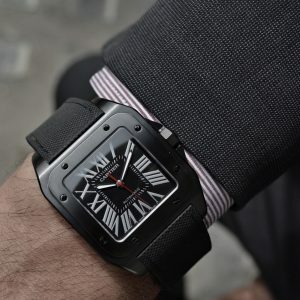 With square watch case and stretched lugs, Panthère de Cartier is quite similar to Santos De Cartier, but its long flexible bracelet with many links express its uniqueness fully. It was the main series as soon as it made its debut, and it faded away until 200 in the market. 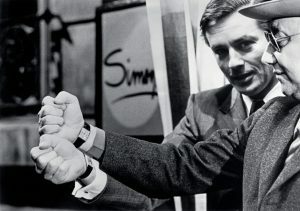 Pierce Brosnan once wore a Panthère de Cartier watch. 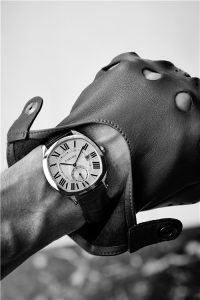 Panthère de Cartier reappeared at SIHH 2017. 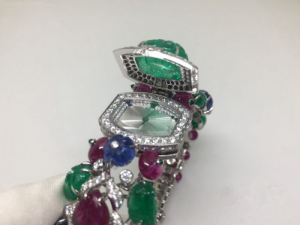 It was studied carefully and found that its all designs were the same as the original, such as the case shape, the bracelet, the octagonal crown set with a faceted synthetic spinel, eight screws on the bezel, Roman numerals and track scales. 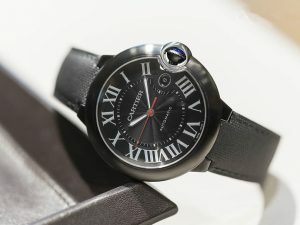 Even CARTIER is kept well in the X hour marker. Available in 18K yellow gold, white gold, pink gold, yellow gold and steel edition, diamond edition or steel version. 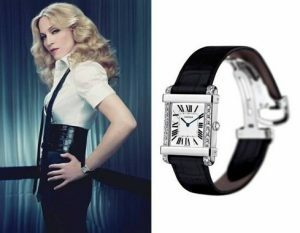 Besides, Panthère de Cartier white gold & diamond watch (No. 2) was decorated with distinctive but vivid leopard prints with an enamel technology. 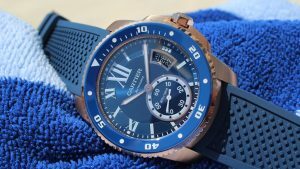 Another Panthère de Cartier pink gold watch (No. 1) was created with irregular leopard prints on the case, the dial and the bracelet with black lacquer, as if the soul of the panther was fused into the perfect timepiece.